The joys of craft in a cute animal world with endless possibilities of personalisation every time children play, crafting their own story not once, but over and over again. Fuzzikins are adorable fuzzy animals to colour and play. These craft sets offer hours of fun customising the Fuzzikins and their world! 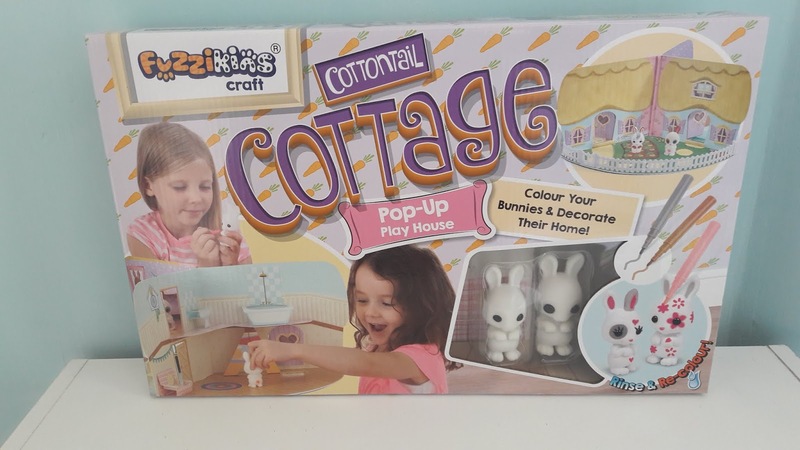 Today I have the chance to giveaway a Fuzzikins Cottontail Cottage set to one lucky person. The Cottontail Cottage craft & play set offer hours of fun customising the rabbits and their house and creating accessories for them.The Cottontail Cottage comes with two bunnies and a pop-up cottage play house which folds away neatly to save space when not being used.The set includes plenty of accessories to decorate the cottage with. Open the hard covers and reveal the two storey house with a kitchen, living room, bathroom, bedroom and a garden. For ages 4 years+. Not suitable for children under 36 months due to small parts that may represent a choking hazard. The felt-tip pens in this set are washable, but they may stain certain surfaces, carpets, or fabrics. Read the instructions before use, follow them and keep them for reference. The set comes with 2 cute bunnies. The set comes with two bunnies. This is so cute, my granddaughter would love it. It comes with two bunnies. It comes with 2 bunnies! It comes with Two bunny figures. This is so adorable. The set comes with two bunnies. How cute! Cottontail Cottage comes with 2 bunnies. COTTONTAIL COTTAGE comes with 2 very cute bunnies.